As the weather gets warmer and we all get ready for summer, we make sure to check a few pretty important items off our homeowners checklist, ensuring a smooth transition into those blissful summer months. The chimney for loose, deteriorated, or missing mortar. 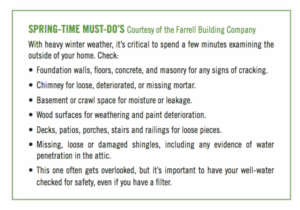 Your basement or crawl space for moisture or leakage. All wood surfaces for weathering and paint deterioration. All your decks, patios, porches, stairs and railings for loose pieces. And don’t forget the attic vent screens for damage. Cut back and trim all vegetation that seems to be too close to the house. Test all outside hose bibs for leads before using them. Clean your fireplace – especially after all of the winter use. For those that have a dishwasher in your pool house you likely would’ve added anti-freeze to the dishwasher’s basin for the winter prep. At this time, you should flush the antifreeze from the dishwasher by running two – three cycles to rinse the antifreeze from the dishwasher’s tubes and plumbing. Although it is nontoxic, you do not want to ingest any antifreeze or eat food prepared on dishes coated with the substance. Check all your window and door hardware to ensure they are in working order. As you’re checking the windows and doors, venture to the bathrooms to check caulking around showers, bathtubs, sinks, and the toilet base. Don’t forget to check tile joints for adequate grout. This one often gets overlooked, but it’s important to have your well water checked for safety, even if you have a filter. We hope that you enjoy a safe and productive spring!